St Josemaria Escriva believed that "those who are called to the married state will, with the grace of God, find within their state everything they need to be holy, to identify themselves each day more with Jesus Christ, and to lead those with whom they live to God" (Conversations with Saint Josemaria, no. 91). 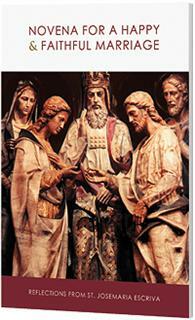 The new edition of the Novena for a Happy and Faithful Marriage is a publication from the St. Josemaria Institute inspired by St Josemaria's desire to help all married couples, and those preparing for marriage, to find meaning and encouragement in their vocations, especially when facing inevitable difficulties and times of trial. Daily reflections from St Josemaria Escriva’s “Marriage: A Christian Vocation"
The novena is also available as an app for iPad and iPhone - click for details.